The gables and roof are components, which really does make it a lot easier to draw things. 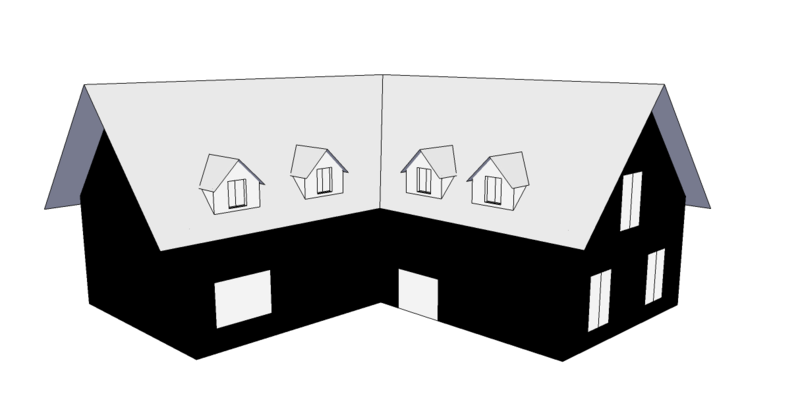 I was wondering how the gables would turn out when they intersected the roof, but that’s what Intersect with Model is for. So I learned how to do that. Unfortunately, I learned how to do that before I made a roof component with overhangs, so I had to redo Intersect with Model. Or rather, I redid it for the far right gable, then I thought, “What the heck, it’s not professional work.” So I didn’t redo IwM for the other gables, and you can tell if you look closely at how their roofs intersect with the house roof. Which actually is kind of instructive. One of those cases where being lazy and incomplete is actually the right thing to do. Like not rewriting the previous sentence to be less grammatically ambiguous. The gables were white in the cartoon. I have since changed them to black in the file, but refrained from uploading. If the cartoonist is lazy, who am I to disagree?